Peter: [turning down a cigarette] Can't, they smell your breath. Arvid: Then we better not listen to this music, they may listen to your ears. Courtesy of Southern Music Publishing Co. Inc.
Love the Movie with All My Heart! One of the basic reasons I like this movie is because it was one of the first movies I watched with my older brother that we both enjoyed. I don't have a lot in common with him, but this one movie opened up lots of opportunities for other movies. Other than that, I love this movie for its unique point of view. We always get the movies like Saving Private Ryan or Pearl Harbor, which are very important stories in themselves (and good movies of course) but how often do we get a movie about people who were part of the war from the beginning. people that didn't necessarily have a direct threat, but were still greatly affected. The story of Peter and Thomas and Arvid are wonderfully done. Peter is the kind of person any girl would like. Thomas, the rich brat that speaks his mind too much, helps put internal conflict in the group. Arvid seems to be the voice of reason, seeing what the Nazis are doing and doesn't want to be a part of it. The acting is great, of course. Peter, played by Robert Sean Leonard, is portrayed as soft spoken, confused, and even a little bitter. Thomas, played by the beautiful Christian Bale, is the kind of people that drive me nuts - just "go along with it. We can have it both ways." It is virtually impossible to have it "both ways." The guy who plays Arvid is a lovely actor, obviously talented, and shows emotion so well you'd think he went through this himself. 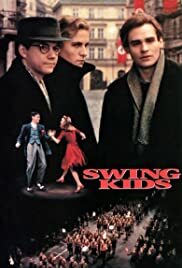 The history of the movie might be a little tweaked to make a few interesting scenes, but to see what the Nazis were doing to the youth of their country, brainwashing them and telling them to spy on people, is appalling. No wonder a few former Nazi soldiers still think they were right. The music is like a whole nother character. This movie is what really got me to enjoy listening to swing music. Even though I can do very few steps, I realize now the feeling they got when they heard it and I get the same feeling, just not quite as strong probably. All around, this movie is wonderful. I love showing it to my friends, and it is very interesting and jerks at your emotions.